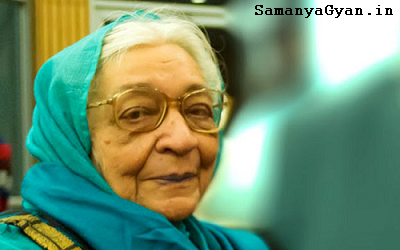 Renowned Hindi littérateur Krishna Sobti has been chosen for Jnanpith Award 2017, the Jnanpith Selection Board announced on 3rd November 2017. Born in 1925 iin Gujrat in Pakistan’s Punjab Province, Sobti (92) is known for experimenting with new writing styles and creating “bold” and “daring” characters in her stories who were ready to accept all challenges. Her language was highly influenced by the intermingling of Hindi, Urdu and Punjabi cultures. Some of her celebrated works include Daar Se Bichhudi, Mitro Marjani, Zindaginama, Dil-o-Danish, Badalom ke Ghere, Ai Ladki and Gujarat Pakistan Se Gujarat Hindustan. Several of her works have been translated into other Indian languages and also in Swedish, Russian and English. She has been the recipient of many coveted awards in the past, including Hindi Akademi Awards, Shiroman Awards, Maithli Sharan Gupt Samman, Sahitya Akademi Fellowship and Padma Bhushan.